Make sure that the information is printed clearly and visibly. Also make sure that the following information is present. -Name, address, & telephone number: This must be the current contact information of the person responsible for the chemical (e.g., chemical manufacturer or importer). -Product identifier: This is how the chemical is recognized. This should include the chemical name and code/batch number. The responsible party can also include any additional relevant information. The key to this component of the label is consistency, so the product identifier must be the same on the label as it appears in other documents. 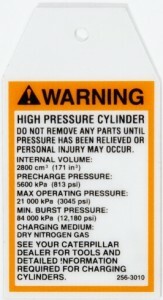 -Signal words: This word is linked to the potential dangers of the contained chemicals: “Warning” or “Hazard.” “Warnings” are less hazardous dangers than “Hazards.” A label will only include one or the other classification. 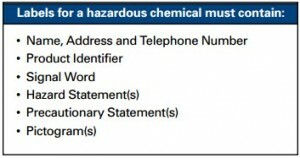 As a general rule of thumb, the presence of any hazardous-level chemicals warrant the classification, and label, of “Hazard” (even if there are additional chemicals that only warrant a warning). 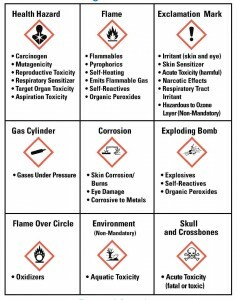 -Hazard statements: This section of the label must also include ALL of the potential warnings of a chemical, such as the particular risks associated with the chemicals (e.g., chemical may cause burns to the skins or kidney damage if ingested). Where appropriate, all hazard statements may be combined for ease of reading. -Precautionary statements: These are the statements that describe the proper storage, handling, and use of chemicals in order to reduce exposure to any potential hazards. Be sure to include all relevant statements: prevention, response, storage, and disposal. In instances where multiple actions are appropriate, a forward slash (/) can be used to demarcate the possible choices. -Supplementary information: This is the place on a label in which a responsible party may include relevant information that is not required on a label by OSHA standards. Perhaps additional chemicals (not mandated for disclosure by OSHA) can be included, at the discretion of the responsible party of a chemical, can be placed on this section of the label. Just be careful that any non-required information in this section of the label does not detract or contradict the required label information. Visit the OSHA Brief for complete information on the Hazard Communication Standard. You can also streamline your movement to the new OSHA safety sign standards by outsourcing your labels to a company who knows the intricacies of the protocols for safety labels. Feel free to contact U.S. Nameplate for any additional information about developing your new labels. I agree that by updating the regulations of these labels it will help to raise the safety of the ones that are using these chemicals. Also, it’s best to get regulations in place as soon as possible rather than waiting until the last minute. That way it’s a gradual shift in change, and everyone affected by it will be better prepared. Thanks for sharing!